I pulled back onto the main road, my rear wheel sliding as it transitioned from dirt to pavement. With the sun beginning to make its descent, I headed south on Route 28 out of Delhi, N.Y. I was tasked with testing the new XCx for the detailed Common Tread review and I couldn’t think of a better way than an overnight camping trip through the Catskill Mountains in New York. 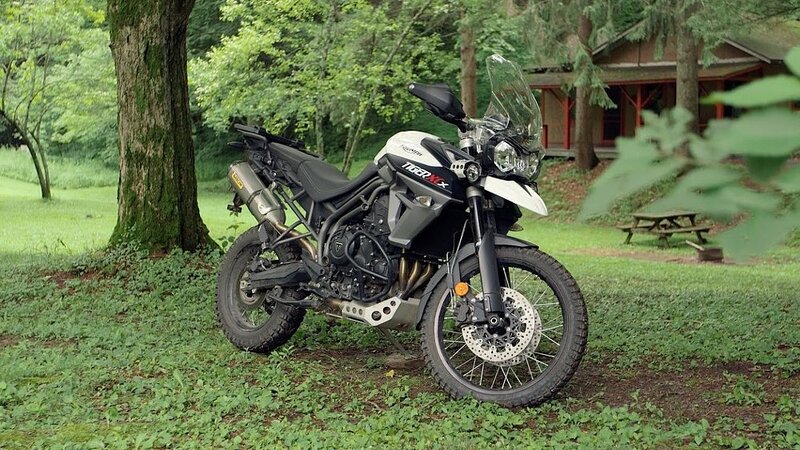 Not only was it a great way to test the new Triumph, but it also provided an opportunity to begin a new series where we explore the joys of camping with a variety of machines and motorcycle camping gear. The Downsville Dam sits alongside Route 30, my favorite stretch of long sweepers in the Catskill Mountains. Photo by Spurgeon Dunbar. I had passed a small campground earlier in the day and retraced my steps to see about finding a spot for the night. Roughly 15 miles past the single stoplight in Downsville, I rode up to the entrance for Ox-Bow campsite. I was welcomed with a firm handshake from the weathered hand of a gentleman named Tom, the owner of the campground. Tom made it clear that there was plenty of room at the inn and I followed his well worn four-wheeler down a dirt path to the banks of the East Branch of the Delaware River. He guided me to a spot by the water and told me to make myself at home. While I busied myself with unpacking and setting up my tent, he set off to gather me a load of firewood for the night. Campsites at Ox Bow sit right alongside the East Branch of the Delaware River. Photo by Spurgeon Dunbar. When it comes to camping, I am a man of the basics. My old Cabela’s tent is the same one I bought for my first motorcycle trip to Virginia back in 2005. It cost me $50 off of the discount rack and has seen both coasts and quite a bit of the country in between. My Coleman sleeping bag is slightly newer, as it replaced my old bedroll in 2008 while preparing for a trip to Joshua Tree National Park. I learned the hard way how cold those California deserts can get at night. And that folks, completes my list. I have been thinking about adding a folding cot to the mix but I have been putting it off. I am not ready to admit I am not as tough (i.e., bullheaded) as I was in my 20s. Setting up camp as I realized I forgot the matches. Photo by Spurgeon Dunbar. With my tent set up, and the sunlight fleeting, I rummaged through the Triumph’s panniers looking for matches. How did I manage to forget the matches? I had been a Boy Scout. I was supposed to be prepared for anything, yet I forgot one of the most essential items required on a camping trip: fire. Looking at my watch I realized that if I hurried I might be able to make it back to the gas station alongside Route 17 before it closed for the night. In this particularly rural area of the Catskills, the small filling station doubled as a general store. I grabbed my helmet and took off, desperate to make it in time. The temperature had dropped significantly with the arrival of nightfall and I was thankful for the Tiger’s heated grips. These are a luxury none of my personal bikes have that I could easily get used to. As I rounded the last corner the plate glass windows of the gas station reflected off of my headlights. No light shown from within. With the store closed for the night and I needed an alternate plan. At this point it was 9:30 p.m. and the next town on the map was about 20 minutes away, on the other side of the mountain. I knew it had a gas station, but I had no other information. So I took off, riding blindly into the night. The gas station was still open as I pulled in, slightly frozen, at 9:56. I purchased a lighter and some Yuengling (thank you, New York, for having liquor laws more sane than those back home in Pennsylvania) and had no sooner exited the building when the lights switched off behind me. After procuring a lighter, I was able to warm up next to the fire and enjoy my dinner. Photo by Spurgeon Dunbar. Back at camp, I used some old newspapers for kindling and soon had a fire burning steadily. Sitting on one of the panniers, I ate a dinner of peanuts and beer with an apple thrown in for dessert. I sat and watched the flames lick the sky until I was out of firewood. With that, I crawled into my tent and let the sound of the river lull me to sleep. It was shortly after 6:30 a.m. when I woke to face the crisp mountain air with a slight hint of smoke lingering from smoldering campfires. I broke camp and headed off back down Route 30 through the Catskills. Starving, I stopped for a breakfast of bacon and eggs at the Downsville Diner, where I sipped hot coffee until the morning chill left my body. There is nothing better than diner food for breakfast on the open road. While there are countless stretches of great roads in these mountains, if I could only pick one it would be the 40 miles of Route 30 from East Branch to Margaretville, N.Y. 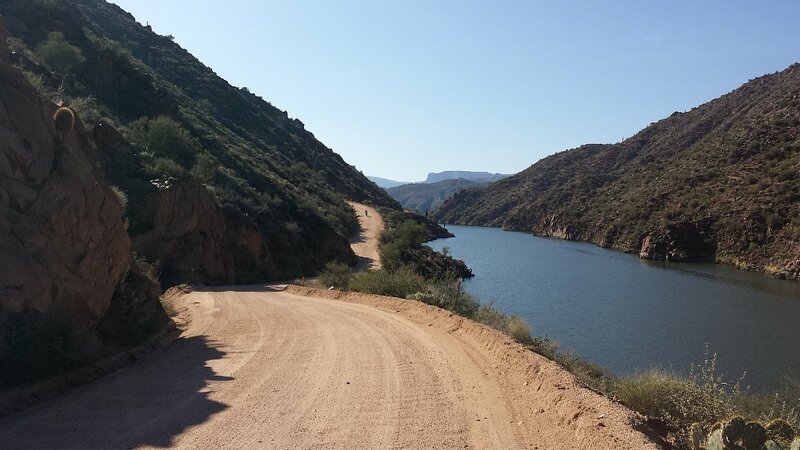 It perfectly mirrors the curves of the mountain streams and reservoirs it follows, providing motorcyclists with countless sweeping corners to carve. Before I knew it, the sun was high above me, hinting that it was time to head south towards Philadelphia. Heading home to Philly the long way on Route 97 through Port Jervis, N.Y., gave me the opportunity to run the Hawk's Nest. Photo by Spurgeon Dunbar. While these trips often end too fast, they do wonders to sooth my restless soul. All it takes is a weekend outside of the city limits, armed with nothing but a few camping supplies and a bag of peanuts to realize we can all do with less. 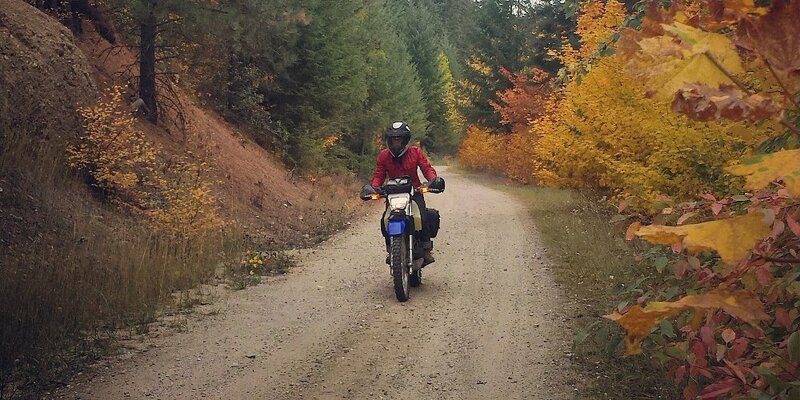 Motorcycle camping offers the perfect excuse to escape the city in search of adventure. Too often we get caught up in the hustle and bustle of our daily existence. We make excuses for spending our weekends tackling chores or other countless obligations. It is important to remind ourselves how easy it is to escape it all once in a while with a $20 campsite, a $3 tall boy, and a $2 bag of peanuts. Just don’t forget the matches.